Three attorneys contend each of the named city officials be fined and that the city bear their legal costs; city attorney says council complied with open meetings law. Hours after three trial lawyers sued the city of Seattle Thursday over the City Council’s abruptly called special meeting and vote this week to revoke a head tax on big businesses, an anti-tax campaign submitted the required signatures for a citywide referendum asking voters to repeal the measure, if necessary. The No Tax on Jobs campaign opted to submit 46,372 signatures shortly before 4 p.m. Thursday, just in case the unrelated lawsuit’s contentions — that, in their haste to repeal the controversial ordinance, Mayor Jenny Durkan and a council majority “repeatedly violated” the state’s Open Public Meetings Act (OPMA ) — might invalidate Tuesday’s council vote to reverse the head tax. The campaign had a deadline of 5 p.m. Thursday to submit its signatures and keep the referendum alive. A source close to the campaign said the campaign and its lawyers believe the city’s repeal vote will stand, making any repeal referendum moot. City Clerk Monica Martinez Simmons accepted the campaign’s ballot petitions but said she didn’t plan to send them to King County Elections for a sufficiency determination because the city already had repealed the head-tax ordinance. “We’ll keep them here” until further consultation with the City Attorney’s office, she said. The campaign’s decision to file the signatures came a few hours after three lawyers — James Egan, identified as the case’s plaintiff, and Julie Kays and Lincoln Beauregard, who are representing Egan — filed a lawsuit in King County Superior Court, contending that “without any public debate, and with pressure of a repeal referendum growing,” Council President Bruce Harrell on Monday announced the special meeting to conduct the repeal vote. “Prior to the announcement, it was expressed and understood that Mayor Jenny Durkan, along with the City Councilmembers at issue, Bruce Harrell, Sally Bagshaw, Lorena Gonzalez (sic), Lisa Herbold, Rob Johnson, Deborah Juarez (sic), and Mike O’Brien, had reached an agreement, via unlawful clandestine discussions, to repeal the original ordinance enacting the head tax,” the suit states. The city contended Thursday it didn’t break the law. Durkan’s office released a legal analysis from City Attorney Pete Holmes, who found the city complied with the law’s notice requirements and public-process guarantees. “We therefore believe the courts would hold that the requirement of the Open Public Meetings Act were fully met,” Holmes wrote. The lawsuit, which relies heavily on details from a Seattle Times online story posted Monday, also contends the city’s media notification of the special meeting violated a state requirement for special meetings requiring that such notices be given 24 hours in advance of the meeting. The lawyers’ suit, which has been scheduled for trial in June 2019, seeks that each of the named city officials be fined and that the city bear all of their legal fees and costs, but it doesn’t ask that the council’s vote to repeal the head tax be invalidated. “To be clear, this lawsuit does not challenge the legitimacy of the ultimate vote, only the clandestine tallying and debate,” the suit states. Katherine George, a Seattle lawyer who handles government transparency issues, said case law suggests it’s unlikely the repeal ordinance would be invalidated based on any potential private discussions before the public vote, however. Despite the city’s legal take that the repeal vote complied with the law, the anti-tax campaign’s steering committee met Thursday to decide whether to submit the required 17,000 signatures needed before the deadline to qualify a referendum asking voters to repeal the tax. After a majority of the campaign’s board voted in favor of doing so, CBE Strategic — a local political consulting firm headed by former Deputy Mayor Tim Ceis that also does business with the city — immediately resigned from the campaign over a disagreement with the decision. Ceis declined to comment on his resignation. Harrell and other council members who cast votes to repeal the tax had sought to avoid the need for the anti-tax campaign to submit its signatures. Backed by Amazon, Vulcan, the grocery industry and others, the campaign has amassed more than 46,000 signatures and $380,000 in contributions to repeal the initial council vote in May that unanimously approved the Employee Hours Tax. By a 7-to-2 vote on Tuesday, the council repealed the $275-per-employee head tax on the city’s 585 largest business. The tax was set to take effect in January. 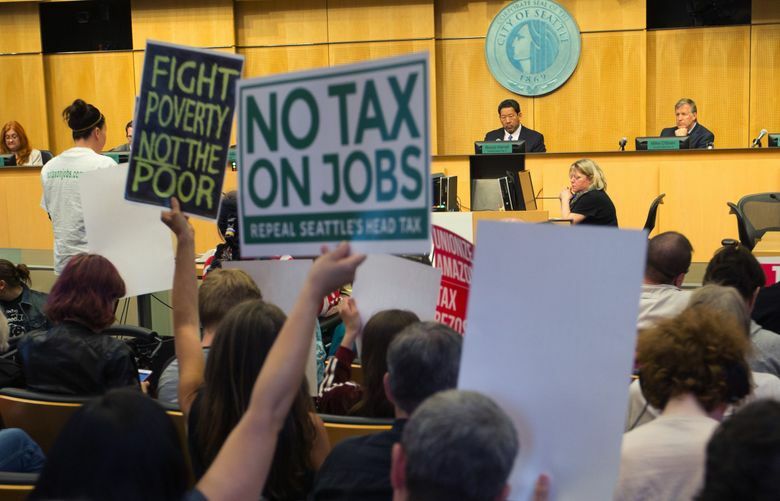 The day before the vote, Durkan and all seven council members who would later cast votes to revoke the tax issued a joint statement, citing a “prolonged, expensive political fight” as the need for a vote to reconsider the ordinance. Some council members later said that negative public polling and mounting contributions to the repeal campaign spelled trouble for the city’s head-tax law. The way the city handled the repeal process raised questions among several open-government advocates, who said that the elected officials appeared to have secretly deliberated about the issue in violation of the law. Toby Nixon, board president of the nonprofit Washington Coalition for Open Government, has said the open-meetings law and prevailing case law have determined an illegal meeting can occur even when a quorum of a government body doesn’t meet in the same physical site. It can also happen through a chain of phone calls or written messages, or when a third party, such as a mayor or a surrogate, acts as a go-between to convey information to individuals so that a collective meeting of the minds occurs on an issue. Council members Bagshaw and Johnson told The Times this week they’d been advised before the vote that a majority of council members supported calling a special meeting to vote on the repeal. Under the open-meetings law, “each member of a government body” found in violation faces $500 civil penalties for a first offense. As the city’s executive, a spokeswoman for Durkan said, the mayor isn’t a member of the council, so wouldn’t face such penalties. In his analysis, Holmes found that while the city’s notice to the media about Tuesday’s special meeting came 10 minutes after a required 24-hour advance- notification period, the law states such notices are only applicable to media that have previously filed a written request for such notices. The city found no such media requests in its archives, Holmes wrote, and the city met the time deadline for all other required public notices. In its statement Thursday, the No Tax on Jobs campaign said it agrees with the city’s legal reasoning, but nonetheless took a cautious approach to file the signatures. Egan, Kays and Beauregard, the attorneys who sued the city Thursday, have all previously challenged the city in past high-profile legal battles. Beauregard, who represented Delvonn Heckard — the first man to last year publicly accuse former Mayor Ed Murray of sexual abuse and defamation — cited his past experiences with the city as partly prompting his participation in Thursday’s suit. He noted that in July, when González sought to call on Murray to resign, Bagshaw appeared to be lining up votes behind the scenes to resist González’s effort. All three lawyers now suing the city are opponents of the head tax, Beauregard said.